The punch from hurricane-strength winds is quick. In the Caribbean, the storms whip across the islands tearing out trees and shattering buildings. Monitoring hurricanes is a centuries-long tradition. But with all hurricanes, and even with less formidable rain storms, comes the threat of landslides and flooding to the hills and valleys on the islands' mountainous terrain. To help emergency personnel evacuate regions at high risk to these secondary rain-induced hazards, a consolidation of technology is needed, says Randall Updike of the U.S. Geological Survey in Denver. He is working with colleagues at the USGS, along with scientists from the National Oceanic and Atmospheric Association (NOAA) and NASA, to establish a united front on forecasting landfall disasters from hurricanes in the Caribbean. UNESCO (United Nations Educational, Scientific and Cultural Organization) and The World Meteorological Organization also support the proposed idea, Updike added. Currently these organizations often operate independently of each other. Updike presented his proposal of bringing the groups together at the annual meeting of the American Association for the Advancement of Science in Denver on Feb. 15. "What we are aiming at here is from the time the hurricane starts being tracked as a true hurricane we will continue to watch it until people are out of danger," Updike says. "The problem in the past has been that people know they are in danger in a general way, but don't know to evacuate the hillsides, at risk for landslides, or the gullies and flood plains." 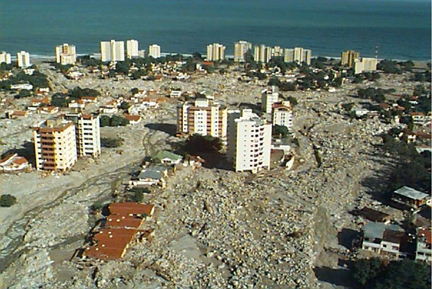 Debris flows resulting from a tropical storm inundate a Venezuelan town on the Caribbean coast, December 1999. Photos by Matt Larsen. He is looking to establish Puerto Rico and Hispanola (an island embracing the Dominican Republic and Haiti) as the prototype islands for the project. The two islands present a range of technological capabilities and socio-economic conditions. The project will establish a combined landslide and flood monitoring system linked to hurricanes that will assess the disaster risks for the islands and help disseminate the data in real time to government and emergency officials. Updike estimates it will cost on the order of $5 million to $10 million over a three year period to bring the collaborative efforts to fruition. Says Updike: "What we will learn from this will be a benefit to other parts of world." He hopes the system will help scientists and public officials better address the typhoon hazards in Southeast Asia and the hurricane risks in Central America. Landslides leave Venezuelan houses in a precarious setting. 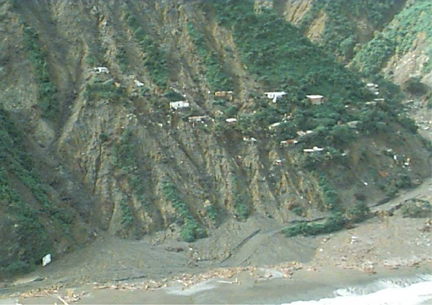 Much of the devastation in Puerto Rico from Hurricane Hortense in 1996 occurred because of the 5 to 10 inches of rain that came with it, according to NOAA's National Hurricane Center. The USGS has since improved its extensive rain and stream gauge network in Puerto Rico, providing a model on which the project will be based. "We have a lot of the conceptual scientific information in place, as well as the hardware in terms of a hydrologic monitoring network," says Matthew Larsen, USGS Caribbean District Chief. "We have 130 rain gauges that report via satellite to our station in San Juan and 100 stream flow stations that do the same thing." Under non-emergency conditions the gauges send their data to the satellite every hour, although some still take as long as four hours to report back. When the gauges detect rain or stream flow exceeding a certain level, they kick into alarm mode and begin transmitting their data to the satellite every five minutes. The levels are automatically displayed on a public Internet site and transferred to local agencies in Puerto Rico that are set up ahead of time with direct modem access. "It's a cooperatively funded network," Larsen explains, with the USGS and local government agencies supporting the gauging stations and communication network, and USGS monitoring and maintaining them. The alarm mode for the rain gauges is triggered when the gauges detect rainfall intensity of 12 millimeters per hour, equal to 0.48 inches per hour. The threshold of rain before landslides occur is usually about 180 millimeters in a 24 hour period, but, as Larsen explained, 80 millimeters in three hours or a steady but slow rain over days can also trigger landslides. Flooding, Larsen says is more difficult to put a threshold on as the flood risk is specific to land use and slope. In general though for streams, the data is transmitted every five minutes when the river stage rises 31 millimeters in 5 minutes, or 37 centimeters in an hour. "If a river continues to rise and is anticipated to reach a level that the USGS, Civil Defense, or Water Authority officials consider hazardous, then evacuations begin."